Baby spotted eagles open wide for the camera in the Polessye State Radioecological Reserve in Belarus. A family of elk rove the forests. A house, long since abandoned and fallen into disrepair, stands in Chernobyl's Exclusion Zone. The area is still avoided by humans — but animals are thriving. A herd of ponies in the brush. 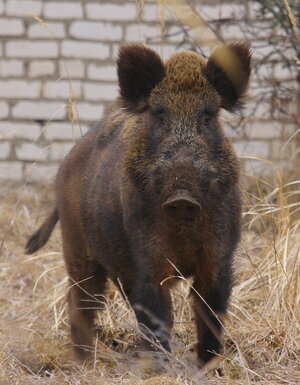 Researchers studying large mammals in the area around Chernobyl found robust population numbers. When you think of a nuclear meltdown, a lifeless wasteland likely comes to mind — a barren environment of strewn ashes and desolation. Yet nearly 30 years after the disaster at the nuclear reactor in Chernobyl, in the former Soviet Union, a very different reality has long since taken root. In and around Chernobyl, wildlife now teems in a landscape long abandoned by humans. The area has been largely vacant of human life since 31 people died in the catastrophe and cleanup. "It&apos;s well-established that when you create large reserves and protect wildlife from everyday human activities, wildlife generally tend to thrive," says Jim Beasley, a researcher at the Warnell School of Forestry at the University of Georgia. He and a team of fellow researchers embarked on a study of the Chernobyl exclusion zone — specifically, the sector that rests on the Belarusian side of the Ukraine-Belarus border. They aimed to better understand how animal populations had been affected by the world&apos;s worst nuclear meltdown. "Our study specifically looked at mid- to large-size mammals," Beasley says, "so everything from hare- or rabbit-sized animals, wild boar, moose — everything up to apex predators like wolves." They wanted to see just how resilient these mammals were — and their data came back with a clear pattern: populations have resisted decline, and in many cases even flourished. "None of our three hypotheses postulating radiation damage to large mammal populations at Chernobyl were supported by the empirical evidence," Beasley and his co-authors concluded in a paper they published recently on the topic. Now, that&apos;s not to say the animals themselves are healthy or not. Beasley is careful to note that their study did not look at particular health effects in the mammals. And, as for humans, Beasley cautions that we shouldn&apos;t get ahead of ourselves there, either. His findings have little to say about how safe the area is for humans to return. "Humans are much more long-lived than wild animals," he says. "So I would be cautious to extrapolate those findings to humans." But they did come to one clear conclusion. "What our study does suggest is that even if there are potential subtle genetic effects" from the lingering radioactivity in the area, Beasley says, "those effects are greatly overshadowed by the impacts humans have on the environment." In other words, it may be a radioactive wasteland, still unsafe for humans, the simple fact of their absence has helped open the door for other mammals to flourish.